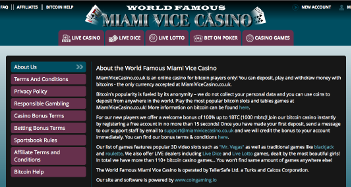 Interested in Playing Slots Online Using Bitcoin? 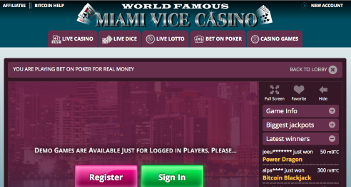 Hey – welcome to our Miami Vice Casino review. This is one of our more unique reviews because Miami Vice accepts bitcoin …and …nothing else. They don’t accept American customers, which is odd for a bitcoin casino. Many of them accept Americans because there are no hard and fast laws like there are for fiat currencies. Everyone else – read our review below to learn more about Miami Vice. Chances are this will be the most in-depth review you’ll read since they’re brand new and hardly anyone has covered them yet. Real simple. They only accept bitcoin. The good news is Miami Vice is known for their near instant processing for both deposits and cash outs – a natural perk of using bitcoin. It doesn’t look like there are any limits, either. Also good news. It’s a 100% match up to 1 BTC. The min deposit for this offer is 10 mBTC. It’s not cashable and it has a 35x play through on the bonus. The first two… those are what you should get excited about. Especially BetSoft – they’re known for their killer 3D slot games. Overall you’ll have 100+ games to choose from. I highly recommend visiting BetSoft’s website (BetSoft.com) to see all their games – especially their 3D titles. You can play most, if not all of them for free. And once you do I think you’ll see what I mean. 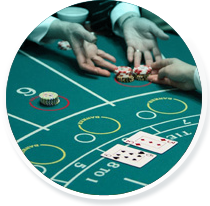 Table Games: This will include titles like Poker 3 Heads Up, Let It Ride, Pai Gow Poker, Red Dog, Baccarat, Oasis Poker and War. There are more than 28 titles to choose from. Roulette: Choose from 9 titles including Live Roulette, American and European Roulette. Video Poker: There are 25+ titles to play here, which include Double Joker Poker, Jacks or Better, 10s or Better, Five Draw, Aces and Faces, Deuces & Joker and Deuces Wild. Live Dealer: Play games dealt by a real dealer. 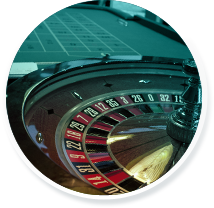 Your options include Live Baccarat, Roulette, Blackjack, Dice, Bet on Poker and Lottery. Blackjack: Choose from more than 15 variants including Classic Blackjack, Pontoon, Super 7, Face Up 21 and European Blackjack. Not half bad, am I right? Yeah, there are only 100 or so games to play, which pales in comparison to casinos that offer more than 400 slot games (let alone other titles). But on the bright side Miami Vice does have a diverse selection of games. Do you join Miami Vice …or …are there better options out there? They accept bitcoin and are one of the only casinos we’ve reviewed that do. You get instant deposits and withdrawals (thanks to accepting bitcoin). Their games come from Aristocrat and BetSoft, two solid software companies. You can play live dealer games. Bitcoin has dropped in value over the last 6-12 months. Just a few months ago each BTC was worth around $600. Now it’s worth around $230. That means their only offer is worth just a couple hundred bucks. A 35x rollover is pretty high. The good news is it’s only on the bonus. They only have 100 or so games. Most non-US casinos have 3-5x that – AT MINIMUM – while the top casinos (their competitors, mind you) have more than 1,000 games. 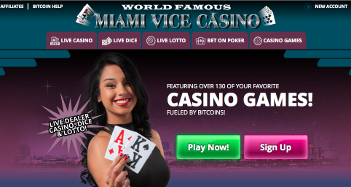 I give Miami Vice Casino a B.
I think they’re a solid enough casino for people wanting to use bitcoin who also don’t happen to need tons of games or lots of promotions. So if you’re just looking for an easygoing experience with some neat 3D games, then you might consider giving them a shot.